Eyes of more than 3 spaces are big eyes. Big eyes have more eye liberties than the number of empty points in the eye. The following diagrams explain. Beware however, big eyes can be small in the corner. The following discussion follows from the small eye liberties page. Karl Knechtel: These diagrams show the big-eyed groups completely surrounded. Liberties are kind of useless in these cases. Please refer to the examples at the bottom of the page for more practical application. As a summary of the number of internal liberties each shape has in a capturing race, see the table below. So a four-space big eye has 2 + 3 = 5 liberties. That's three liberties for the "three-space eye" and two more liberties for the additional step above. Karl Knechtel: This result also holds for the "square" arrangement for a 4-point eye. Other 4-point eye spaces are alive. Remember that two eyes trumps any consideration of liberties from a "capture-or-be-captured" perspective. Again we count two liberties before the first capture, and three this time around. 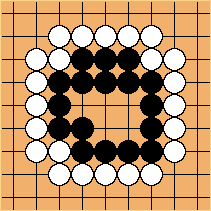 White's next play must be at the indicated point, or else Black makes life. 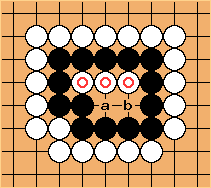 Note the difference though: The square cannot provide two eyes since it takes two moves in a row to DivideTheSpace; the T-shape (pyramid four) depends on sente. 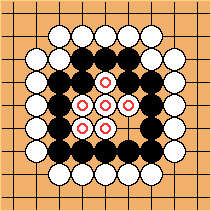 As a result, if a semeai starts involving the group with a T-shaped eye, there has already been a play inside, so only four liberties remain. ... a four-space big eye with five liberties. 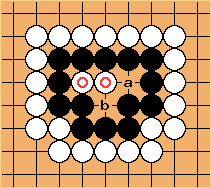 Summing up, a five-space big eye has 3 + 5 = 8 liberties. By the way, this shape is also known as the bulky five. That's five liberties for the "four-space big eye" and three more liberties for the additional step above. You get the idea. Karl Knechtel: The greek cross also provides 8 liberties in the same way. 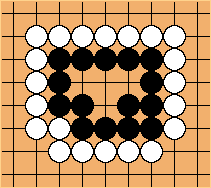 Both of these shapes can be made alive if Black gets to play next, so as before, these shapes generally give only 7 liberties in a semeai. Other 5-point shapes are alive. ... will get reduced to a five-space big eye. It has 4 + 8 = 12 liberties. Karl Knechtel: Yet again, you really only get 11 liberties in a semeai, since opponent will have already played here - otherwise, you can make life. A very reduced set of eyes of seven spaces can be killed. 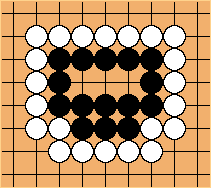 White can almost Fill Black's 7 space big eye with a Rabbitty Six, a killing shape. 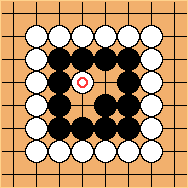 After Black captures, a six space eye remains, leaving 12 liberties. Black's capture cancels out one of the five stones, giving a grand total of 17 liberties. The situation is extremely rare. If this actually comes up and there is a semeai, you get 17 - 2 = 15 more liberties. This is a boundary case of sorts: All seven-space eyes are alive normally, but some of them are extensions of the unique 6-point dead shape, and can thus be turned dead with enough stones inside. 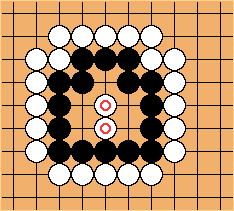 Since there are no dead 7-point shapes, it is impossible to kill a group with an 8-point eye in this way. 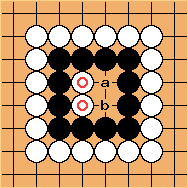 (This assumes alternating play after the inside group is captured, with the owner of the captured group going first.) This is why, although we can extend the proverb to say "... and seven is seventeen", it makes no sense to continue with "... and eight is twenty-three". HandOfPaper: For those who are curious, the formula for continuing the uselessness is "n is (n^2-3n+6)/2". The theory is summarized by the proverb Four Is Five And Five Is Eight And Six Is Twelve : 4=5, 5=8, 6=12. iopq: In a semeai, then what counts is 4 = 5 with no stones inside, 5 = 7 with one stone inside, 6 = 11 with one stone inside and 7 = 15 with two stones inside. golearner Took a look at the related problem above at goproblems. Fascinating problem, very interesting. When I read the comments, there was a good question about the solution (if White plays J2 instead of K1). Anyone stronger care to check? golearner Another interesting problem -- doesn't seem related to this page though. No big eyes that I can see. Good example for corner ko, maybe.